LeBron James did it. He outscored the greatest of all time. With a 3-pointer from the left wing late in the third quarter of the Cleveland Cavaliers’ Eastern Conference finals series-clinching 135-102 win over the Boston Celtics in Game 5 on Thursday, James became the all-time leading scorer in the history of the NBA playoffs, surpassing Michael Jordan for the top spot. James’ game-high 35 points put him at 5,995 career postseason points and counting, ahead of Jordan’s 5,987. After the game in which King James seized Jordan’s throne as the best playoff scorer in league history, ESPN’s Dave McMenamin asked him to put his achievement into words, and the 1-minute, 19-second response he gave is nothing short of amazing. Through his answer, we saw a side of James different from what we’ve grown accustomed to experiencing in his postgame news conferences over the years. This wasn’t the man who once told a room full of reporters during the NBA Finals, with no shame or doubt, that he was “the best player in the world.” This was the kid in James who displayed his utmost respect and humility toward his hero, Michael Jordan. 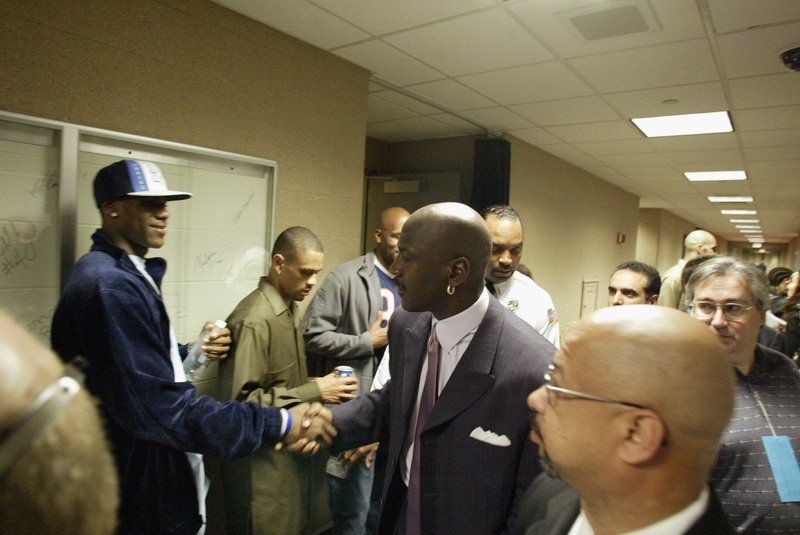 James reached the playoff points milestone more than 14 years — 5,161 days, to be exact — after shaking hands with his idol on April 8, 2003, following a game between the Washington Wizards and Cavaliers in Jordan’s 15th and final NBA season. James was just 18 years old and still in high school at St. Vincent-St. Mary, where he paid homage to Jordan on the court by rocking his famed No. 23. Two months after that encounter, the Cavaliers selected James with the No. 1 overall pick in the 2003 draft, and upon arriving in Cleveland, he elected to continue to wear No. 23. Yet, six years into his NBA career, James spoke out against players wearing Jordan’s former number, saying the GOAT (greatest of all time) deserved the Jackie Robinson treatment with a leaguewide retirement of the No. 23. “I feel like no NBA player should wear 23. I’m starting a petition, and I’ve got to get everyone in the NBA to sign it. Now, if I’m not going to wear No. 23, then nobody else should be able to wear it,” James said in 2009. James wore No. 6 for four seasons with the Miami Heat before returning to play for the Cavaliers in 2014 and going back to his old number. So, fittingly in Game 5, No. 23 broke the original No. 23’s all-time playoff scoring record, although James admitted after the game that his quest to be like the GOAT while growing up went far beyond his jersey number. “I did pretty much everything that MJ did when I was a kid,” James said. “I shot fadeaways before I should have. I wore a leg sleeve on my leg and folded it down so you saw the red part. I wore black-and-red shoes with white socks. I wore short shorts so you could see my undershorts underneath. I didn’t go bald like Mike, but I’m getting there … it’ll be post-career, though. That’s the only thing I didn’t do. These heartfelt words, however, weren’t even the best way James honored the man whose record he broke. On this historic night, James’ most important tribute could be found after the game in his locker, where the new playoff scoring leader kept a pair of Air Jordan 1s. In LeBron James' locker postgame: a pair of the Air Jordan Retro 1 High OG. Nice touch.